An energy research center led by UCLA has been chosen by the U.S. Department of Energy as one of its Energy Frontier Research Centers and awarded a four-year grant of $9.75 million. With the funding, the new UCLA-led Synthetic Control Across Length-scales for Advancing Rechargeables center, or SCALAR, will help accelerate research on new types of chemistry and materials for rechargeable batteries. The researchers will seek to increase battery capacity, stability and safety. The center’s director is Sarah Tolbert, a professor of chemistry and biochemistry in the UCLA College and of materials science and engineering at UCLA Samueli School of Engineering. Other partners in SCALAR are UC Santa Barbara, UC San Diego, Caltech, the University of Southern California, and the Stanford Synchrotron Radiation Lightsource, a DOE laboratory. 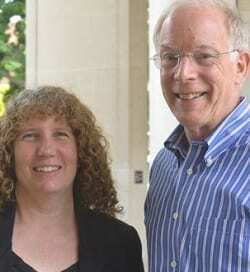 UCLA professors Sarah Tolbert and Bruce Dunn are the director and associate director of the new center. Bruce Dunn, UCLA’s Nippon Sheet Glass Professor of Materials Science and Engineering, and chair of the UCLA Samueli materials science and engineering department, is the center’s associate director. The grant to UCLA was one of 42 such awards, totaling $100 million, announced by the Department of Energy. Established by the DOE’s Office of Science in 2009, the Energy Frontier Research Centers program brings together researchers from multiple disciplines and institutions — universities, national laboratories and nonprofit organizations — to spur work that strengthens U.S. economic leadership and energy security.